Overview of R: What is it? Mathematics of Discovery for Creativity? David Rose, Head of the Tangible Media Group at MIT Media Lab and author of the book: "Enchanted Objects: Design, Human Desire, and the Internet of Things" Reading. We followed this work for years. How can consumer products be enchanted objects? " ... specializing in how digital information interfaces with the physical environment. A former CEO at Vitality, a company that reinvented medication packaging, he founded Ambient Devices, which pioneered technology to embed Internet information in everyday objects like lamps, mirrors, and umbrellas. Currently Rose is the CEO of Ditto Labs, and his work has been featured at New York Museum of Modern Art and in The New York Times, and parodied on The Colbert Report. ... "
See also his TedX presentation on Enchanted Objects. And recent interview on the Daily Show. Which included a look at Smartstones Startup (at minute 6).
" ... Last week beacon technology--sensors which can trigger actions in devices that come within range, increasing their spatial intelligence--shrank in size and grew in opportunity with the introduction of Estimote Stickers. Three millimeter-thick adhesives no bigger than an oversize postage stamp, the nearly weightless Stickers--dubbed "nearables"--are an impressive evolution of the egg-sized Beacons that Estimote introduced in 2013. “Beacons are a little bit like URLs for the physical world,” says Steve Cheney, cofounder and senior vice president. “We don’t know exactly how it’s all going to work out, from the experience level, but I think the apps you use the most will start to integrate beacon technology in a way where you assume it was always that way.” Like the larger Beacons, Estimote's Sticker-sensors, set to ship this fall to curious developers and companies eager to take advantage of the internet of things, help apps “see” their surroundings via motion and temperature sensors that communicate with nearby devices via Bluetooth. ... "
Are we all data scientists now? I think so, and in particular we need to get the owners and experts using the data to understand its analytical potential. They can then alert the technically adept scientists to do the work. Have worked with a number of groups at MIT. Here a slide show that covers computing developments that have come from there.
" ... I make my living helping people understand and communicate information derived from data, so Big Data has produced a greater appreciation for my work. Here’s the rub: Big Data, as a term with no clear definition, which serves as a marketing campaign for technology vendors, encourages people to put their faith in technologies without first developing the skills that are needed to use those technologies. As a result, organizations waste their money and time chasing the latest so-called Big Data technologies—some useful, some not—to no effect because technologies can only augment the analytical abilities of humans; they cannot make up for our lack of skills or entirely replace our skills. Data is indeed a valuable resource, but only if we develop the skills to make sense of it and find within the vast and exponentially growing noise those relatively few signals that actually matter. Big Data doesn’t do this, people do—people who have taken the time to learn. ... "
Ensemble methods are means of using multiple approaches to solving an analytical problem. Different tools can be better for different machine learning problems, or even different data. Here is a thumbnail history and description. Also the WP entry. And a post on Random Forest methods. Looking at the math to make mobile maps more meaningful. Could also be applied beyond geographical maps to maps of knowledge or interactions. Even virtual reality representations.
" ... Karlsruhe Institute of Technology (KIT) researchers say they have developed a method to ensure mathematically optimal adaptation of the labeling to the perspective and driving direction on digital maps. ... The researchers say the challenge is in keeping the representation and labeling clear, no matter how the user adjusts the visible range and how the route continues. "When the labelings overlap, jump, or flicker, the added value is lost and a driver distracted by irritating representations may be a danger in road traffic," says KIT researcher Martin Nollenburg. ... "
Have recently started to look at how expertise matches tasks that need to be done. I have worked in this area in the enterprise to attempt to optimize resource allocation. I was pointed to a resource called O Net Online, which includes detailed job task and resource descriptions. Here is the entry for 'Supply Chain Manager', which I studied in some detail. While I would disagree with some of the entry, it is still a good place to start. Generally would need to adapt to your situation anyway. Further, in our new data intensive world, it is also necessary to add the specifics of data needed to do the work AND the data needed to feed any analytics needed to do the work effectively. Also consider needs like the data pattern understanding that might lead to better results. Making those connections leads to better focus and results. Also can lead to better tailoring of key advisory systems. From the Boston Consulting Group. Obvious perhaps, but also a number of interesting statements and statistics. Every company that plans to be around in the coming decade needs a digital plan.
" .. Consumer packaged goods (CPG) companies need to plan for a “1-5-10” market in the United States during the next five years, in which digital’s current 1 percent penetration will likely expand to 5 percent and could accelerate to as much as 10 percent in short order, according to a new report, The Digital Future: A Game Plan for Consumer Packaged Goods, prepared for the Grocery Manufacturers Association (GMA) by The Boston Consulting Group (BCG), Google, and Information Resources, Inc. (IRI). The report highlights how CPG companies can best position themselves for growth and unlock digital and e-commerce opportunities. Digital penetration of 5 percent represents nearly one-half of total CPG growth during the next five years, meaning that companies without an effective digital capability risk stagnation, loss of share, and even shrinking sales. Early movers, on the other hand, have the opportunity to establish leading positions that will be difficult for others to infiltrate. Digital penetration rates will vary in different locations and categories. Some categories could see digital penetration of 30 percent or more by 2018. ... "
Brought to my attention. Strong emphasis on storytelling. " ... THE BIF MANIFESTO: We believe that business model innovation is on the critical path to transforming our important social systems including education, health care, and government. Tweaking our existing models and systems won't work. We need to imagine, prototype, and test new models and systems in the real world. ... "
In RetailWire: Short piece on the topic with statistics. Have been asked to look at this from a Big data, near real time perspective. I have worked with an auction company in establishing their offering taxonomies. Also have worked with the technical process of auctions. I see that Cowan's auctions has now allied with several other companies to form a new online auction service BidSquare Auctions . Following. Their blog also has some interesting instructive content. Colleague Diego Kuonen just gave an update of his excellent talk: A Statistician's View on Big Data and Data Science. Good place to start.
" ... There is no question that big data have hit the business, government and scientific sectors. The demand for skills in data science is unprecedented in sectors where value, competitiveness and efficiency are driven by data. However, there is plenty of misleading hype around the terms `big data' and `data science'. This presentation gives a professional statistician's view on these terms and illustrates the connection between data science and statistics, and highlights some challenges and opportunities from a statistical perspective. ... "
McKinsey on digital Strategy. Podcast and text. " ... Incumbent companies face critical decisions when it comes to addressing digitization. In this video interview, McKinsey director Paul Willmott argues the first decision is fundamental: whether a company is even in the right industry. That’s because digitization is blurring the lines between sectors, placing fresh demands on both leadership and organizational strategy. This interview was conducted by McKinsey’s Bill McIntosh, and an edited transcript of Willmott’s remarks follows. ... "
Have been involved for some time in using technology for compliance systems. I have mentioned the local company Contract Guardian here for some time. They develop systems that manage the complexity of contracts, and delivered many in the health systems area. Have seen their systems and updates demonstrated a number of times, and have been impressed. In their most recent press release, I see that they are now connected with DocuSign. " ... a leading solution for managing company contracts, commitments, and compliance is pleased to announce the native integration of DocuSign, the world's leading e-signature solution, into our web-based Contract Management application. ... "
A lengthy Nature report with many statistics. Some surprising. I would further like to see why people outside, or just slightly outside a particular academic or technical field, use Social Media. I frequently find myself in that situation. Wanting to efficiently follow developments. 'Lurking' as it is sometimes called. Terse communications can make that easier. In EBN: The need for what they call data maturity. Well, yes, absolutely, all the data and metadata needs to be 'mature'. But defining that can be a problem. Especially an issue for informally managed metadata. Good examination and infographic map of the resilience part. Have been examining Splunk (SPL) as it has been applied to a number of dynamic data problems. Impressed by it capabilities. Both for its search engine-like examination of data, and for creating processes for data mining. Here for a complex regulatory problem at Barclays. Worth a look and examination. Free for full examination at scale. Several of my larger clients are using it. Continued interest in how IBM Watson will be applied to real business problems. There will be a demonstration today in NYC that we are following. Quite an interesting claim to be able find interesting patterns without direct queries. More to follow.
" Watson Discovery Advisor has been upgraded to seek out hidden relations in data ... The service will provide you leads "when you don't know the question to ask, and for when you want to uncover and discover in the data new insights and patterns," said Steve Gold, IBM vice president for the Watson platform. "It turns out there is a huge appetite in industry for this type of capability," Gold said. "Many of these industries, through traditional approaches, have found it time consuming and tiring to get through the information and find new insights." ... "
15 sec video clip showing chemical structure discovery w/Watson Discovery Advisor. Updated: Specific examples of application and more background. In Adage: Had not heard of this. A device-based hidden context detection in mobile. " .... Facebook Targets Ads Based on Cell Signal Strength ... Social Network Ramping Up Ad Efforts in Emerging Markets ... ". What other device contexts can be read from an App that can even be remotely used for Ad targeting? I can hear the Big Data grinding. In IEEE Spectrum: Transparent tiles that can capture solar power? Work underway at Michigan State.
" ... Like many food companies, Kraft Foods has had to deal with the rising costs for commodities, as well as the changing wants and needs of consumers. Several years ago, the company — which has annual revenues of more than $18 billion and a 27-brand portfolio that includes Velveeta, Jell-O and Kool-Aid — was launching new products at a rapid rate, but it wasn’t really investing in any of them. In recent interview on the Knowledge@Wharton show on Wharton Business Radio on SiriusXM channel 111, Barry Calpino, Kraft’s vice president for breakthrough innovation, discussed how Kraft rethought its strategy and reaped the rewards of a multi-year, multi-channel mindset to marketing. ... "
In Wired: Overview of advances in biochips, chips that mimic the activity of the body, used for the development and testing of drugs. I note the term new to me: Organoids. We participated in several examinations of these methods.
" ... But if they come to fruition, organoids could lead to even larger opportunities, beyond the speed of drug research and the price of medications. Today, much pre-clinical work is done in animals and doesn’t always yield results that mimic how human systems work. “The knowledge gaps we face in biomedical research are enormous. We just don’t know all that much about what causes diseases,” says Bernard Munos, the founder of the Innothink Center for Research in Biomedical Innovation who also sits on the Cures Acceleration Network board. “We’re really throwing darts.”But if they come to fruition, organoids could lead to even larger opportunities, beyond the speed of drug research and the price of medications. Today, much pre-clinical work is done in animals and doesn’t always yield results that mimic how human systems work. “The knowledge gaps we face in biomedical research are enormous. We just don’t know all that much about what causes diseases,” says Bernard Munos, the founder of the Innothink Center for Research in Biomedical Innovation who also sits on the Cures Acceleration Network board. “We’re really throwing darts.” .... "
Interesting short case study using Porsche as an example. Examining the concept.
" .... The age-old problem of disconnection in the supply chain can be eased through the use of social media, argues Tony Martins. He recommends powerful but somewhat informal "hives": "A hive is not a functional group. A universal principle I've learned over the years is that, generally speaking, collaboration isn't needed within a functional group; it is needed across skill sets. So, you should not create functional hives," Martins advises ... "
" ... Someone in our Smartstones "early bird" VIP community is going to be on the Jon Stewart Daily Show tonight. He also offered to give a peak-a-boo spotlight on Smartstones! Wow!!! Thank you! 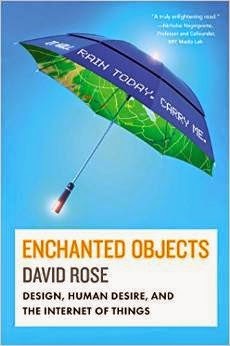 David Rose, head of the Tangible Media Group at MIT Media Lab and author of "Enchanted Objects" is a thought leader in the area of connected devices and new experiences that bring joy to the world of people, and great progress for technology. We encourage you to look for Smartstones on The Daily Show tonight - it will also be airing for the next four nights if you miss it. Please check out David's book on Amazon. ... "
David will be interviewed by Jon Stewart, The Daily Show on Comedy Central tonight at 8:00pm EDT/5:00pm PDT. He will raise awareness of Smartstones and the power of touch, to the millions of people who watch John Stewart and The Daily Show every night!!! Also, he'll share a personal story about how he and his daughter have a special way of communicating non-verbally (I'm sure David and John will put a funny spin on this), and are excited for the possibility to have that closeness go mobile with the help of Smartstones! ... "
Jump to 6:00 of the interview on The Daily Show with Jon Stewart on Smartstones. "It's a lovely way of humanizing technology"
How would you expand on your statement in a recent blog post that data is the new natural resource, and what implications does this development have for computing? Every time we record our lap time with an app, map directions online, or post photos on social media, we are creating a blizzard of new data. This is very exciting because today we have ways to make sense of all of this data like never before. Unlike in the past, when only statisticians and information scientists with supercomputers could crunch this data, now, thanks to cloud computing and mobile apps, we put these powers into everyone's hands. For consumers, this makes us powerful and the same can be said for marketers—in fact, it can be a significant competitive advantage. Just like countries that are sitting on top of oil reserves, gathering and making sense of data can generate wealth. Some of the data may also be a commodity. Therefore, it's really about how it is used and combined with other data. For example, IBM is working with police departments in the US to use data to predict areas in a city where crimes are likely to occur. Or with Watson, we are sifting through data to help doctors diagnose patients from a mobile device anywhere. That's powerful .... "
Piece on how Netflix uses big data analysis. To derive Golden Data. I like the term, but can it be effectively derived? Sounds much like the need to be closely connected to the decision makers involved. Few can lay claim to the instincts needed to rely on gut alone, leading Donza to the concept of ‘golden data’ – the crucial data points that will help a brand connect with an audience emotionally. “For the time being its problematic to rely on just data or all on the golden gut,” he explained. “Look at all the points of information, whether they be gut or data, and allow them to guide you to a stronger answer than you could come to on your own.” .. "
More by NASA on the use of swarms. Nice to see work of this type still coming out of the space agency. See the mention of the use of simulation methods to test the swarm operation. See my previous posts on the earthbound potential of swarm systems.
" ... In 2010, the company set itself the target of doubling its revenues in a decade or less – without doubling its costs. According to Greg Swimer, Vice President for Business Intelligence at Unilever, information management was to play a crucial role in achieving this goal. To help its employees make better decisions, the company sought to embed data into its business processes and make effective use of data visualization and analytics. ... "
I was a very early user of the Tivo DVR system, used it until we were hit by lightning. I see they are now trying to pick up some of the legally nixed Aereo traffic with a wireless DVR system for users without Cable. They say it is legal and brilliant. Described in Adage. Clever idea, that I think has been tried before. Now from Cornell and elsewhere and supported by a number of big technology companies. Why not learn from the Web? We all do. See the examples of recent learning, which are an indication there is still much to learn. In the CACM: Good article on the state of digital medicine. Useful introduction to current technologies and implications. Reviewing. In the HBR: Good piece about how IBM used a broad re-invention of a known idea to change itself. In much evidence now by the huge investment being made by IBM in delivering this. Creating a platform rather than just a product. A platform that embodies and integrates many of its current products and aims to deliver them efficiently on the Cloud. Also key is the closer integration of analytics and data availability methods. Lots still to be done to effect the change. In K@W: Fairly obvious, back to the meaning of how different kinds of consumer contexts and behaviors influence internet use. We went into retail to examine it. You can now observe this in most any public space. Have not read this, but plan to. " ... According to a new book by Wharton marketing professor David R. Bell, where you live dictates how you use the Internet. In Location Is (Still) Everything: The Surprising Influence of the Real World on How We Search, Shop, and Sell in the Virtual One, Bell provides a framework for those who wish to understand why we use the Internet as we do. ... " . Has a link to an interview.
" ... Under the leadership of Pete Blackshaw, Global Head, Digital Marketing and Social Media, Nestlé created the Digital Acceleration Team (DAT), a digital leadership training program for digital marketing projects at Nestlé. The 12 members of each class are available to work on short-term projects that Nestlé units apply for. Then they return to their units, bringing with them what Blackshaw calls “digital vitamins” — a supplemental expertise that can be used to assist digital transformation in the graduate’s home unit. ... "
Also interview at MIT Sloan. Anyone have more references to this? I have had a number of people ask me the question: What is it? Who uses it? I have been surprised that some schools are not teaching it. It seems more of a tool use for acquired needs. And is increasingly being used to for research and sharing. Good introductory piece about what it is, but not how to use it. I like the cautions included, you rarely see that in a resource book. Lots of other posts and resources for its use have been listed here. Quite an interesting article, especially with regard to the integration with 3D printing.
" ... The future of computer-aided design (CAD) tools, in light of recent developments in three-dimensional printing and additive manufacturing, was the focus of a recent workshop by the U.S. Defense Advanced Research Projects Agency's Information Science and Technology group. Industrial and academic experts from manufacturing and mechanical design fields noted most CAD tools provide limited or no integrated models of physical and material properties to designers. Panel members also said current tools are very limited in terms of their ability to capture and make use of design requirements in such a way that they become testable during the design process. Moreover, it was clear to all participants that the exploration of design spaces requires automated or semi-automated synthesis. ... "
Good thoughts and examples. It is often too how the overall concept of the design works that makes the visualization good. Further, consider the devices on which the visualization will be delivered, and the extent to which any interaction with the data will be needed. Brought to my attention: the Wright State University Department of Information Systems and Supply Chain Management. Just spoke at their MS program for the fourth year in a row on supply chain technology innovation. From Wired: Another example of robotic swarms. The idea might be to use a large number of relatively simple robotics to perform a task, the task might be sensory, for example. We examined a a large warehouse inventory problem. Having many simple robots means they are redundant and could perform the task more quickly. More complex tasks might include performing cooperative activities.
" ... Alone, the simple little robot can’t do much, shuffling around on three vibrating tooth-pick legs. But working with 1,000 or more like-minded fellow bots, it becomes part of a swarm that can self-assemble into any two-dimensional shape. These are some of the first steps toward creating huge herds of tiny robots that form larger structures—including bigger robots. Building swarming robots can also help scientists understand collective behavior seen in nature, from bird flocks and fish schools to networks of cells and neurons. ... "
In Forbes: This sounds new, but we examined similar methods nearly a decade ago. Is it useful to immerse yourself virtually in your data? At the time it was found to not be useful, but perhaps now it will with advanced technology, and more complex data. Looking further. I will post a link or two about that we did back then here when I find the links. Here I float within my data in 2008. But what if we could present the data in a way that’s more “empathic”, closer to the way in which we usually address the world? That’s exactly what scientists at the CEEDs (which stands for Collective Experience of Empathic Data Systems) project, a consortium of 16 partners in 9 European countries, are trying to do. Using the eXperience Induction Machine (XIM), an immersive multi-modal environment located at Pompeu Fabra University in Barcelona, they are trying to use virtual reality to enable users to ‘step inside’ large datasets. Since, as they say, an image is worth a thousands words, you may want to have a look at the video below, to see how it works. ... "
Giving a talk today at Wright State University on the topic of the 'New Analytics'. This is the fourth year I have given this invited talk. This year I am making the case that adding 'non quantitative', decision based methods, like those developed in cognitive computing and Watson, will bring analytics closer to the decision maker. Leading to better analytics leveraging better value in many businesses. Looking forward to the interaction. I was pointed to a site that shows some of GE's work in the Industrial Internet. See also a post of mine which links to a former colleague's work in this area Shoumen Datta, and more resources from the Industrial Internet Consortium, including his extensive tutorial on the Industrial Internet. Lots of useful information there, contact Shoumen for more information. See also the consortium's blog. In Innovation Excellence. " ... From the Innovation Excellence Cities Tour: Sam Ford, Director of Audience Engagement at Peppercomm Communications shares why storytelling is so important to companies - and why stories have to be about people; not just products or services. ... " . I much like the idea of thinking about the 'right story'. It is important in storytelling, since there are many possible stories. To make your point? Or to allow you to interact with the story and understand alternative implications? The former has dominated. The latter can have more value. From Deloitte. Data visualization of risk. Good piece that looks at the application of descriptive analytics for supply chain risk. The dispersed nature of today’s supply chains creates increasing levels of risk for multinational businesses, making transparency both critical and complex. Without effective visibility into their supply chains, executives potentially have a significant blind spot in their enterprise risk management structure, from which substantial legal, financial, and reputational exposure could emerge. Supply chain transparency isn’t easily achieved; it requires a solid foundation and continuous improvement over time. This article presents a practical four-step approach that companies can take to begin the process of building a transparent supply chain in the current global environment. ... "
Just reminded of this, I know the people involved and it will be quality. Useful for anyone involved in the space. With over 500 websites created and 2 million Google searches made every minute of every day, there is no shortage of data online. Understanding how to use all this data to uncover meaningful insights is a challenge faced by many digital marketers and analysts today. In this 2 day course, we will review the basic principles of analysis particularly in the digital space. We will discuss web analytics architecture, implementation and overall strategy with the goal of not only providing the best practices and examples of how web analytics can be done right but to empower attendees to be more data-driven with business decisions, particularly in the digital space. CIO writes on the obvious increased need and compliance complexity. " ... "We're learning through experience, and what we see happening out there, that more and more of the focus of breaches and attempts to get into systems is being turned toward healthcare," Marx says. Indeed, nearly 34 million people have had their protected health information compromised in large HIPAA breaches, according to data from the Office for Civil Rights. So when employees are educated and trained appropriately on security, the organization becomes that much more secure. ... "
" ... To close out our week of looking at the most popular content from the first half of 2014, we turn to the royalty of shareable content: infographics, animations and presentations. This was unquestionably your favorite category to consume, whether it was on our SlideShare channel, YouTube or right here on IBM Big Data Hub. Let’s review what many of you were watching, “liking” and sharing. ... "
There is much great information here. I say that some of this information, in infographic form, is too dense for my liking. But still considerable value for review. I have been on Google+ nearly since its formation, posted now and then. Have participated in Hangouts, which work well. It integrates well, as you would expect, into a mostly Google ecosystem. But I have not been convinced in its value except beyond access to some of the people participating. Denise Wakeman makes a case for its value. Short piece with four simple ideas. Good place to start, but many details to be completed. " ... Organisations of all shapes and sizes are faced with their supply chains becoming more complex to support the diverse levels of size and needs in new suppliers and customers. As this complexity builds, are your teams spending more time entering and managing data rather than focusing on growing your business? It’s now more important than ever to maintain a well integrated, audited and secure system that can be precisely reported on at every level. ... "
How and why do companies use anthropologists? Here a conversation with one at Intel Corp. Last I know our enterprise had one, though that was not the title used. Answering questions like "What is the future of technology?" That's what I did too. Brought to my attention and meeting with: Coolest Toys on Earth. See their About for more. Local Cincinnati store. Could gamification be connected? See previously here on the Tamagotchi. Probably inevitable. But the fairness of how this data will ultimately be used and shared could be a problem. A clear place for wearable sensor use. Will you get a badge and a wrist watch/sensor when you show up for a job? In CACM: More in the sensor and robotic space space. The advances continue. Human augmentation. " ... Massachusetts Institute of Technology researchers have developed a robotic extension to the human hand that could make common, everyday tasks easier. The extension, which is essentially two extra fingers, could be used to grasp, leaving the hand free to do other tasks. The extra fingers use sensors attached to the human hand to measure the position of the wearer's fingers, and an algorithm controls the output from the sensors to the robotic fingers. ... "
A look in Time Magazine at the first phone that could be called 'Smart': Simon, offered in 1994, at about $900. Link includes usage videos. Only about 50K units were sold. With a lot less capabilities than we have today. Had a touch pad, an Address Book, Calendar, Fax, Filer, Mail, Note Pad, Sketch Pad, Time, To Do list. We had tested large bulky hand held, non-smart cell phones in the mid 1980s. Devices like the Simon were called PDAs at the time, but this one had a phone too. We tested this unsuccessfully, and did not see another smart phone until executive tests of the Blackberry in about 2000. Mainly used for mobile email coverage. More technical details in the WP. And in a MS Research site. Podcast from Knowledge@Wharton. Data has value, and the analytics that uses the data to improve process has value. Now everyone can have the data and analytics they need.
" ... Big data and predictive analytics are creating a big buzz across industries. They are seen as critical tools for making fast and accurate business decisions and a huge source of competitive advantage. In this interview with Knowledge@Wharton, Sudhir Chaturvedi, chief operating officer of NIIT Technologies, suggests that to derive maximum benefit from these new technologies companies need to first define the business outcome that they want. ... "
KDNuggets, always a great resource, I often referred to it from the enterprise, surveys the principal analytics and data mining languages in use today. Nicely done article. I would further like to see how cognitive interaction is starting to be used to deliver and interact with these solutions. Thinking the implications of this. A further recognition that data is an asset. " .... Delaware becomes first state to give executors broad digital assets access Meet the "Fiduciary Access to Digital Assets and Digital Accounts Act." ... "
" ... Talking too much is a sure-fire way to kill a deal. In fact, Lewis-Fernandez says it’s not unusual for a salesperson to talk so much about a product or service that they talk you right out of the purchase. ... “Never underestimate the power of silence,” she says. “There’s an old adage: ‘He or she who speaks next loses.’ When discussing a deal, if you simply stop talking and get comfortable with the awkwardness of silence, your ability to win your argument, sell the product, or a get concession in the negotiation increases significantly.” ... "
In the Informs Analytics Magazine: " .... The journey to digital business is the key theme of Gartner, Inc.'s “Hype Cycle Report for Emerging Technologies, 2014.” According to Gartner, for enterprises setting out on the journey to becoming digital businesses, identifying and employing the right technologies at the right time will be critical. Gartner’s road map to digital business includes six progressive business era models that enterprises can identify with today and aspire to reach in the future: ... ". Includes the Gartner 2014 hype cycle chart, linking it to digital business. In Retailwire: An idea that has been tried a number of times, including in stand alone sample machines. Also called 'tryvertising'. Imagine the potential data from associated promotional message, or linked to loyalty data. Or addressing bundling strategy questions? " ... In Copenhagen, a new grocer, dubbed Freemarket, offers products for basically the price of a review. ... Customers register on the store's website, place an order, and then pick up the "free" products at the store, according to a BBC report. The shop has a limit of 10 products per month. Members also receive gift certificates and special discounts at stores across the country. ... "
" ... By 2020, the Internet of things (IoT) is expected to interconnect 26 billion computing devices in businesses, homes, cars, clothes, animals and pretty much everything else, according to Gartner. That's a thirtyfold increase over the past five years. While the potential for innovation is exciting, it's taking a toll on IT resources, according to survey research from Infoblox. Many tech professionals surveyed said that any required deployments for the IoT will become part of their existing IT network, even though most said their network is already at capacity. It doesn't help, findings reveal, that the business side often does not keep the IT organization informed about their IoT-related projects ... "
To reach the right customer, in the right place and time, with the right offer—perhaps a chicken dinner—you need real-time actionable insight ... From IBM.
" ... Slyce Inc Signs Agreement with Leading Grocery App Network PDN to Provide Visual Search Technology for Photo-Driven Shopping List Creation ... Visual Search Company Slyce Inc. today announced it has signed an exclusive agreement with The Purchase Decision Network (PDN), to provide visual product search services for their own "Shopper" App (www.myshopperapp.com) and other 3(rd) party shopping apps within their network. ... "
A long time ago an enterprise I worked in was talking about acquiring a coffee emporium operation what was to become very successful. But the talk always went back to: We don't know how to run a retail business, especially one that is so close consumer facing. We research, market and make product and make sure it is places on the shelf of retailers in a timely way.... Now a related operation, Starbucks, looks at its HR approaches.
" ... Starbucks, said Mr. Burrows, will now make changes to its workforce management software to give managers more say in keeping work hours reasonable. Mr. Burrows also promised to enforce a rule calling for schedules to be posted at least a week in advance. Consistent practices appear to be a sizable part of Starbucks' problem. In a Reddit.com online forum intended for Starbucks workers, one recently transferred employee checked about company rules with his colleagues: "My new manager has a habit of scheduling people to close (11:30) and then open (4:30), and working 7+ days in a row, and no one bats an eye." ... "
" ... A growing number of South Dakota health care providers are being assisted by a 24-hour emergency medicine hub based in Sioux Falls that uses two-way audio and video feeds. The operator, Avera Health, has a telemedicine network that includes 86 hospitals in seven states in the West and Midwest. It expects to have contracts with 100 facilities by the end of the year. The rapid expansion in telemedicine has led facilities to link up with providers well beyond their immediate region. .... "
From the Cisco Blog: A good simplified, decision oriented view of solving data needs to provide personalized customer service. I like the close inclusion of the decision process. It is not just about the data.
" ... I wrote in one of my recent blogs about the issues and solutions related to quickly combining data that comes in large volumes by focusing on data virtualization and cloud. This can enable seamless customer interactions and decrease client churn, be it in financial services or in the telecom sector. But what is required at an organizational level so that people, process, data, and things come together to enable a superior customer experience and create entirely new revenue possibilities? ... "
A simplified look by a student, at the marketing mix problem using SAS. Nicely presented. A classic problem solved by every company that needs to determine advertising and marketing strategy. Good introduction, though most of the complexity is in the use of the results and their integration into corporate methods. For more advanced blog posts here on marketing mix. Story of the visit of a conference via a mobile robot. The idea is simple, practical to a certain degree. Has been mocked in TV ads. Not quite the same experience as being there, but there has also been considerable increase in just using web conferences for the same idea. We examined the idea for maintenance support in plants, but the cost was too high at the time and added another layer of maintenance. The article here links to video of the experience. Device used was from Double Robotics. Shown at the right. Does this mean we can all have doubles, or more? Of course this is just the earth-bound kind, the drones have now arrived as well. Easier telepresence is here. More from Andrew Tarvin on Humor at work. Why does humor matter? : The infographic. Again see his site for much more. Always liked the idea, but it is harder than you think to make it happen. Andrew has the insight. Founder of the Media Lab, gives a TED talk on a 30 year History of the Future ... We were members of the MIT Media Lab for years and enjoyed his thoughts then. In the WaPo: Having examined how expertise can be augmented by creativity, not sure how this is directly useful. The graphical representation shown is thought provoking. Does it describe creativity? " ... “People listening to music, filing patents, evolution, it’s all the same thing to a mathematician,” Strogatz said. “We like to sort of fly above and take a bird’s eye view of many things that seem to be different. But we hope that people in other fields will realize that this has been under their noses all the time, and there’s science to be done here.” ... "
" ... Well put about transformations, ‘augmenting and scaling’ expertise … Our own work delivering this in the large enterprise found a need for doing a good job in both of these dimensions. - We all appreciate augmenting. We need access to the right data, tailored analytic tools to understand that data and to communicate data based decisions. Ease of search now gets you to an assortment of ‘facts’, but not to focused expertise. - Scaling expertise is also important. Getting expertise to more people, helping them know when they need it. Replacing searched facts with decision oriented expertise. Replacing expertise lost to retirement or changes in needs. Updating expertise to match new contexts. ... "
I will be posting more about this thread as it develops. Please pass along any thoughts or questions you have, Be glad to add short guest posts in the thread. Matt Ridley, the rational optimist, provides a number of reasons to be cheerful. Mark J Perry summarizes. Not what I have been seeing in the news. AdAge Video: I still believe this will take longer than we think. There will be transferal and re-apportionment of many jobs. " ... Are You Obsolete? Yeah, Probably (This Fascinating Video Explains Why) ... Our Video of the Week Offers a Sobering Look at the Effect Bots Will Have on Even White-Collar Jobs. .. "
Ron Wright, correspondent, sends along an article: " .... Brain science and video gaming converge in neurogaming ... " . We have still been unable to capture the full joy and engagement and collaboration that is achieved with video games. Do we need to go deeper or do we have all the data today? Or what are the tasks still needed? In the Future of CIO: I have often had thoughts of how we have come to rely on Information Technology. " .... Organizations rely more and more on technology; the IT department has more and more to overcome. Running at digital speed, people tend to have high expectation of digital flow, very little patience with technology issues, and therefore technology people. Therefore, businesses have to spend enough time focusing on the people element, start with leadership, enhance governance practice, and reinforce IT based on tailored solution and continuous improvement. ... "
In Adage: An intriguing approach. And of course since you are on the Amazon system, the system already 'knows' much about you. " ... Amazon's Square-Like Payment System Could Be Data Goldmine ... Retailer Could Grab Lots of Product-Level Information Through Local Registers ... "
" .. Such information could be used by Amazon in multiple ways, such as enhancing profiles of people who buy on Amazon to better target products to them, or to give brand advertisers information that helps them understand what people buy in stores, what they buy online, and where. ... "
Had not seen this particular way of looking at this. Worth a further look. " ... the various reasons why Portfolio Management is tough to implement with two different Flightmap clients. Where one of the talks focused on the behaviour side (the role of politics, intuition, culture), the second one was more about the inherent (almost mathematical) complexity. In our view of portfolio management as a decision-making process, it requires the Analysis of a number of options (projects, or better alternative portfolios) against certain criteria to get to better decisions .... "
From KDNuggets: A peek into what Google is doing with large scale machine learning. Good technical look with related numbers " ... Sibyl is one of the largest machine learning platforms at Google and is widely used in ranking and scoring of Google products like YouTube, Android app, Gmail, and Google+. Last month, Tushar Chandra, a Principal Engineer at Google Research, talked about how Sibyl is being used at IEEE/IFIP International Conference on Dependable Systems and Networks ... "
Epicurious to use Swirl Beacons to Deliver Localized Servces to In-Store Shoppers. In-store mobile marketing company Swirl Networks ( An iBeacon Network ) has announced a partnership with Epicurious, a Condé Nast online and mobile service focused food. The two companies say they plan to bring exclusive in-store digital experiences to Epicurious' audience. Swirl's marketing platform leverages Bluetooth Low Energy (BLE) beacons to deliver targeted content and offers to consumers' smartphones, based on their specific location and behavior at the store. ... "
More on Beacons in retail. " ... Beacons are showing up everywhere. It's open season for retailers as more apps are developed to take advantage of beacon technology. Sales staff will be equipped with beacon-enabled apps to better identify and help high-value customers; data eventually will be mined by them to learn not only which displays and offers work best, but also where and when they're most effective..... "
In the HBR Blogs: Suggesting that e-commerce is not as divisive to physical as is assumed. May require some registration. The statistics are interesting.
" ... There’s no doubt that digital technology is transforming the retail industry. Digital devices are changing how customers discover, evaluate, purchase, receive, use, and return products. And, yes, more and more customer interactions take place entirely online. Over the past 20 years, e-commerce sales have grown to about 6% of total retail sales (excluding gasoline and food services) and about 11% of Forrester’s top 30 product categories. But though the e-commerce growth rate is attractive, it has slowed from about 30% per year in the early 2000s to less than half that rate today. If the trend continues, e-commerce sales will increase from 11% of Forrester’s top 30 categories to about 18% by 2030—higher in some (such as music) and lower in others (such as food). While 18% is a significant number, it does not exactly spell the end of physical stores. ... "
" ... Chinese scientists develop mini-camera to scan crowds for potential suicide bombers ... Home-grown imaging technology has the potential to help police scan a sea of people for signs of individuals under extreme stress ... "
" ... A new way of analyzing the changing relationships between people, products, physical phenomena, and events ... Big data analytics encompasses a large umbrella of analytic approaches, with new ones now emerging that complement traditional SQL-query processing. One of the most promising new big data analytic approaches is "Connection Analytics," a method for exploring data that uncovers interdependencies between people and/or "things." Connection Analytics can be performed using multiple techniques like graph, machine learning, data mining and others .. "
My former colleague Andrew Tarvin does a TED talk on Humor at work. Also on Facebook. He is now the head Humor Engineer at Humor that Works. He did podcasts at P&G. Nice idea for the enterprise, but has rarely been done well.
" ... Augmented Reality (AR) software and solutions company, Metaio, today announced that the Junaio Augmented Reality browser is the first AR browser to be made available on the Moverio BT-200 Apps Market. ... "
Good view of examples of how realistic commercial 3D printing is being used in manufacturing and how it may realign supply chain systems. Still narrow domains of application, but worth paying attention to.
" ... Imagine getting a call from your doctor if you let your gym membership lapse, make a habit of buying candy bars at the checkout counter, or begin shopping at plus-size clothing stores. For patients of Carolinas HealthCare System, which operates the largest group of medical centers in North and South Carolina, such a day could be sooner than they think. Carolinas HealthCare, which runs more than 900 care centers, including hospitals, nursing homes, doctors’ offices, and surgical centers, has begun plugging consumer data on 2 million people into algorithms designed to identify high-risk patients so that doctors can intervene before they get sick. The company purchases the data from brokers who cull public records, store loyalty program transactions, and credit card purchases. ... "
According to a study done at the University of Oxford, 47 percent of U.S. employment is at risk of being replaced by computerization, but Starwood says these robots are not intended to replace any employees. Rather, they are there to free them up from small tasks, leaving them more time to deal with customers face to face. ...."
Good Wired piece on the challenges for the success of Google Glass. In our own enterprise experiment we also met some of these same issues. Still have not seen them directly addressed by Google in their current versions of Glass. Good reading before you start thinking about an application. The EU rulings that you could ask for posts to be removed from Google web searches have led to more unusual and unexpected results. Not that there are not already memory holes in the web. It seems that there are often external links in this blog that have gone bad. Since items are so interconnected the The 'right to be forgotten', is often interlinked with useful information. Watching the dynamics of this.
" ... One of the most attractive qualities of Hadoop is its flexibility to work with semi-structured and unstructured data without schemas. Unstructured data represents 80% of the overall data in most organizations and is growing at 10-50x structured data. Indeed, Hadoop excels at extracting structured data from unstructured data. HCatalog helps Hadoop deliver value from the output of its labor, by providing access to mined, structured data by those who would consume it: analysts, systems and applications. HCatalog is a metadata and table management system for Hadoop. It is based on the metadata layer found in Hive and provides a relational view through a SQL like language to data within Hadoop. HCatalog allows users to share data and metadata across Hive, Pig, and MapReduce. It also allows users to write their applications without being concerned with how or where the data is stored, and insulates users from schema and storage format changes. ... "
Advertising through multiple sense. In Shopperception. '... When two or more senses receive stimulation at the same time - cause shoppers to stay in the store for a longer time and buy more products ... "
So what are the applications for neurosynaptic chips? That are on the near horizon today? Here are some examples The Internet of Things is a marketer's dream for chip sales. Especially to IOT applications that need sensory capabilities with low power requirements. Or for neural net applications embedded in larger systems. The article also contains more information about its approach, origins and directions. When I worked with a neuromarketing analyis company one of the limiting issues was how to accurately, effectively and economically gather EEG signals in multiple contexts and locations. Annoucement of a company providing these services. No experience with them. In the BBC. New work out of Microsoft on video stabilization. A topic we followed for the analysis of video streams of shopper behavior. " ... Microsoft researchers have found a way to stabilise films and speed them up to make them more watchable. ... To fix the images, the software analyses footage and creates new frames to smooth out camera jumps. .... The team is currently working on ways to turn the research into a Windows application. ... "
In ClickZ: A broad discussion. Have been involved in several projects that have dealt with the management of data and metadata using tags. Its less about the having tags than it is about how these tags are organized, and used for business improving applications like Business Intelligence. Why Hadoop Isn't Killing The Data Warehouse " ..... Apache's open-source software framework is the future, but it won't extinguish the past..." Never thought there was a direct contention here, perhaps just in publicity ... " ... There are two realities here: One reality is that Hadoop, the open source software platform managed by the Apache Software Foundation, doesn't threaten yesterday's data warehouse workloads, and it won't anytime soon—or ever—even though a zero-sum data infrastructure market makes for good reading. The other reality is that for reasons of cost and flexibility, more and more enterprises are moving to Hadoop.... "
In Kurzweil: Podcast and text. Kurzweil and company discuss the dilemma of no labor force.
" ... The jobless economy: a fully automated, engineered, robotic system that doesn’t need you, or me either. Anything we can do, machines can do better — surgery, warfare, farming, finance. What’s to do? Shall we smash the machines, or go to the beach, or finally learn to play the piano? ... "
" ... Currently, I'm in TLV helping develop wikibrains.com, a cool tool to quickly create data visuals. We try to keep the UI as simple and minimalist as possible. ... Every connection made is saved, to then recommend it to the next users mapping similar topics. ... It's creating a semantic web, one map at a time. ... "
Lowe's Innovation Labs debuted its first concept - the Lowe's Holoroom - on June 11, 2014 at the Exponential Finance conference in New York City. The Holoroom is a home improvement simulator that helps customers break past the barriers of project visualization by creating customized, life size representations of room renovation and refresh projects. ... "
Unaware of this work, taking a closer look. Has been a while since hearing of information from Lowes Innovation Labs.
" ... One company that Lowe's Innovation Labs has partnered with is Neurons Inc., a neuromarketing firm that has reduced the cost and increased the speed of this process, alongside delivering actionable results. ... "It has been hugely, hugely successful for inside of Lowe's, and especially inside of Innovation Labs," said Nel. Tapping into the insights offered by "applied neuroscience" feeds into another core goal of Lowe's Innovation Labs as outlined by Nel: namely, understanding what factors truly impact human behaviour. ... "
Received the following recently, have not examined it as yet, but passing it along. We develop predictive analytic platform/products over Hadoop. 1.An automatic prediction system - As the system is becoming complex, typically multi-model automation provides best insight and prediction to complex system. This saves a lot of cost of model development. 2.Agile learning system: This combines collective benefit of human knowledge/suggestions with machine learning. Very useful in medical prediction system, intelligence. 3.Video and image predictive analytic: When you will have millions of video and image feeds, it is not possible to do manual review. We have technology assisted automated image/view review. NLP does not scale up in Hadoop-therefore, new algorithms are needed for predictive text mining in Big data. We use p-tree algebra KNN vertical mining for better result and we have a platform for that. Reported in CWorld: " ... Scientists create self-assembling, working robots ... These origami robots can fold up and walk away ... Then add to the mix that it's a laser-cut origami robot and you have the new robotic technology created by a team of engineers from Harvard, the Wyss Institute and MIT.... " Self assembly is such a biological, powerful notion. Even scary when taken to to its eventual endpoint. Not self replication here, but self assembling. In particular for spacecraft applications that have tight limits in their form and volume requirements. More detailed Wyss Institute report. In AdAge: P&G connecting to two very different subscription services. I like the innovative spirit. In CNN Money: Since this piece was written in March it seems the presence of drones is expected. " ... The next threat to your privacy could be hovering over head while you walk down the street. Hackers have developed a drone that can steal the contents of your smartphone -- from your location data to your Amazon password -- and they've been testing it out in the skies of London. ... "
In the APQC Blog: A space we looked at to try to balance process models using analytics. Or analytics can also be embedded into the rules. Fewer, simpler rules are better. If only to manage them effectively. Good piece. A good view in the BBC of the current state of augmented reality and mention of a number of real commercial applications in place. For example, the IKEA catalog, previously covered in this space. See also AugmentedPixels, a Ukranian company I have watched for some time. Metaio is another notable player, covered here. But one thing that is often forgotten is the deeper intelligence level that could also be provided to augment reality, beyond their usual information layer. Intelligence naturally augments vision, place and need. In the Cisco Blog: A lengthy look at some of the technical underpinning of the Internet of Things from Cisco's perspective. Links to a number of video snippets and further information as well. Worth looking at. A conversation brought up a topic which we called the 'Metadata of Expertise'. Data that relates directly to the description of expertise. A simplistic example might be a trend line extracted from sales data, which would be used to derive a prediction rule. Or a categorization of an anomaly that would lead to a selection of applicable rules. Like all metadata this needs to be managed in terms of lifecycle. Not unlike metadata of the usual kind. 'Metadata of Expertise'. At this point it is broadly described as a means of making sure you have, can deliver, and continue to update needed expertise. The expertise can be human resources, data, decision process or expertise than is embedded in systems. Like Metadata in a database, it has a lifecycle that must be managed to keep it credible and current. In our enterprise experiments we found that the initial and continued credibility was one of the most difficult things to achieve. My particular interest now is how you use data analytics to make that happen. Just announced in IBM Research: " ... What is a cognitive chip? The latest SyNAPSE chip, introduced on August 7, 2014, has the potential to transform mobility by spurring innovation around an entirely new class of applications with sensory capabilities at incredibly low power levels. This is enabled by an revolutionary new technology design inspired by the human brain. ... " The attached infographic contains interesting comparisons. Now how soon will this computing power be available? More detailed paper.
" ... The architecture can solve a wide class of problems from vision, audition, and multi-sensory fusion, and has the potential to revolutionize the computer industry by integrating brain-like capability into devices where computation is constrained by power and speed ... "
" ... Purchase evolution under a loyalty program. Which is better for predicting customer retention: purchases or redemptions? Which factors enable firms to benefit from sharing a rewards program? How managerial attitudes and customer attitudes and behavior affect employee engagement. Variability of customer experience as a predictor of customer value. Daniel Korshun and Yanliu Huang, Drexel University ... "
In Adage: Testing a method for App tracking on mobile browsers.
" ... Google has come up with a way to overcome the ad-targeting gap between mobile web visitors and mobile app users, according to people familiar with the matter. The online ad giant is set to begin testing a new method of targeting tablet and smartphone users that connects the separate tracking mechanisms that follow what people do on the mobile web and in mobile apps respectively, the people said. ... "
The University of Cincinnati Center for Business Analytics is pleased to announce its fall continuing education offerings. These two-day courses will be offered at the Kingsgate Marriott Conference Center at the University of Cincinnati.